With separate editions for junior and senior schools, Independent School Parent is the only magazine to address the issues that really matter to parents who have chosen to educate their children privately. The Guide to Independent Schools provides essential information on over 1,600 of the UK's nursery, pre-prep, prep and senior schools. Acting as an accompaniment to Independent School Parent magazine, the guide is a must-read resource and one-stop-shop for parents seeking practical information and advice on the independent schools sector." You'll receive 8 issues during a 1 year Independent School Parent magazine subscription. 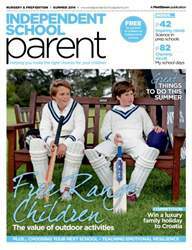 You'll receive 8 issues during a 1 year Independent School Parent magazine print subscription.